Restoring churches for the glory of God! Looking for a church masonry contractor? Drop us a line today for a free no obligation quote! ​Brick, masonry and stone are parts of the unique characteristics of many churches and with proper maintenance may last hundreds of years. 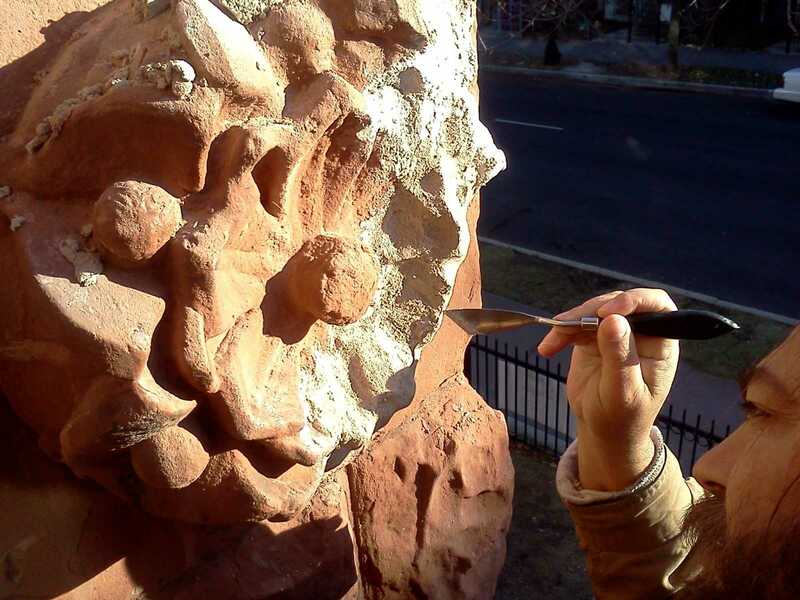 However church masonry, tuck pointing, stone restoration and stucco repair all require a proper understanding of the elements, historic materials, lime mortar mixes and new cementitious compounds that can permanently restore your stonework and masonry. The professionals of Inspired Heights can perform all your church's brick, stone, masonry and stucco repairs. 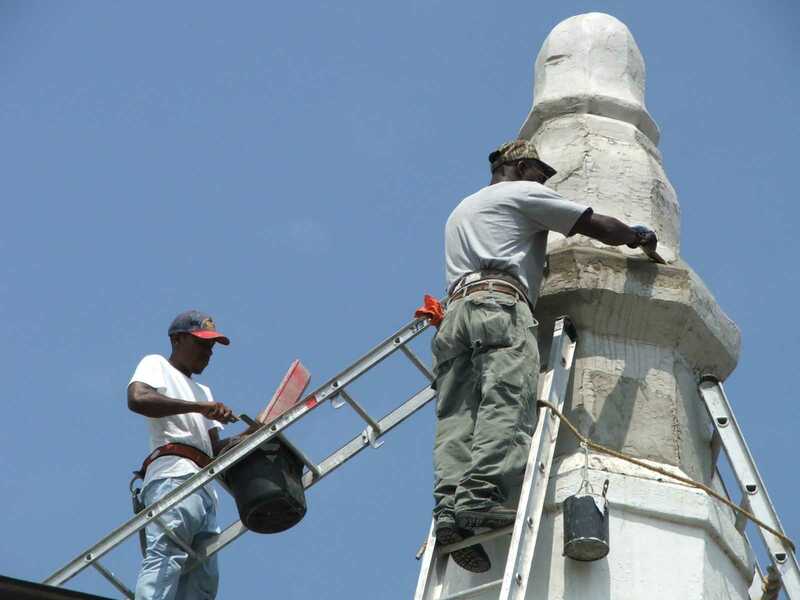 The professionals of Inspired Heights can meet all your church's masonry & stone restoration needs. Church, tower and steeple tuck pointing, historic church brick masonry repair and replacement, stucco repair and etc. Over the years there have been many changes made in the masonry field. Therefore, careful considerations must be made when choosing a church masonry contractor to interact with the historic mortar and traditional building materials that are often found on historic churches. Bricks are formed from clay mixed with sand and fired in a kiln. Older, historic bricks are typically softer than our modern bricks because today’s kilns fire bricks at a higher temperature, resulting in a consistently harder brick. Often the bricks used during the historic period would be locally fired using local materials, further affecting the brick’s consistency. These soft bricks were often used in the building of our historic churches. Because their composition is different, the treatment methods for modern bricks are incompatible with the soft bricks found on historic churches. Inspired Heights are experienced in brick masonry and stone restoration; they are a historic church masonry contractor. 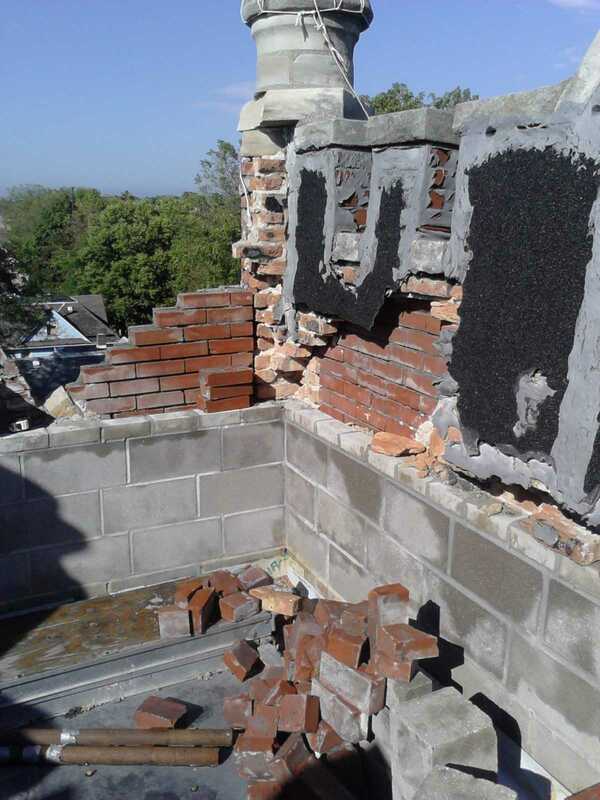 Remember that in dealing with historic brick masonry, it is normal for the mortar to eventually develop cracks, become loose and fall out, creating gaps around the brick. This is considered to be normal and only means that the mortar has outlived its life cycle. Hire a church masonry contractor knowledgeable about historic brick masonry to restore your church masonry in a process known as tuck pointing. 1. Inspection of your brick masonry should be performed by an experienced church masonry contractor on a regular basis. 2. 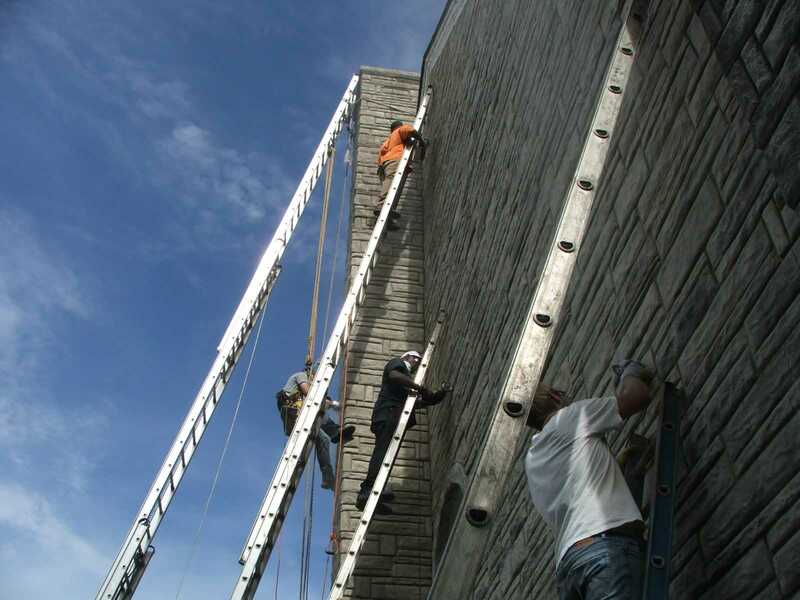 Stucco repair, stone restoration and maintenance to your brick masonry should be made in a timely fashion by an experienced masonry contractor. Delays in simple maintenance frequently result in costly repairs. 3. Direct water away from bricks. Brick masonry and lime based mortars are essentially porous and when exposed to prolonged saturation, deterioration may occur. Quickly repair any leaks from the church gutters, flashings and roofs. You should also redirect any water that pools around the building foundation. 5. 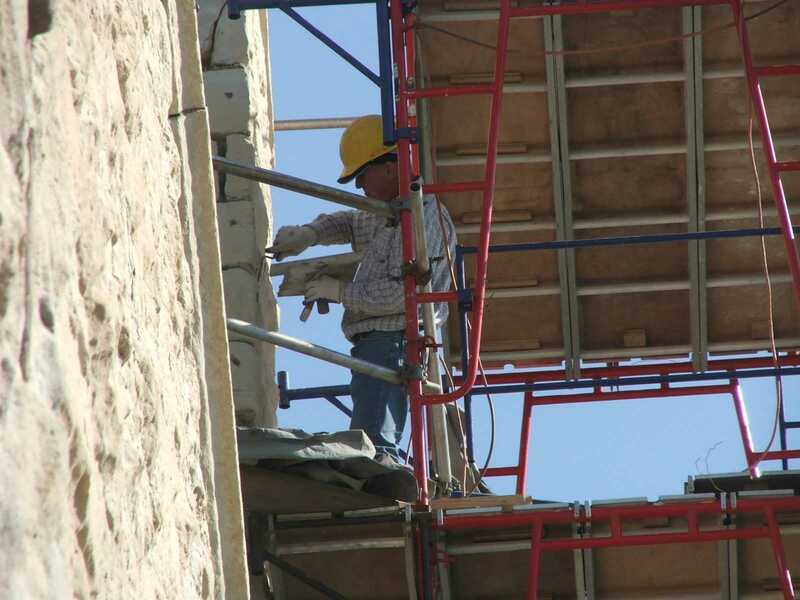 An experienced historic church masonry contractor will never use harsh cleaning methods, such as sandblasting or power washing brick masonry or in performing a stucco repair. These techniques can actually strip the hardened outer face of the historic brick masonry and weaken its integrity. 6. Water sealants, paint and brick / stucco do not mix. Masonry is designed to be porous, and these treatments prevent natural wicking (absorption of water) and moisture release. If you practice the preventive maintenance outlined above, water sealants and paints are not necessary. However, if the church masonry has been painted or treated careful expert evaluation should be consulted by your church masonry contractor to determine the best course of action. For more information on what to look for when inspecting your church masonry click here.